Pet Sitters International - The world's leading educational organization for professional pet sitters since 1994. Includes rats and mice. Veterinary Pet Insurance - The Nation’s #1 Pet Medical Insurance Plan. Includes mice and rats in their plans. art.com - Posters and Prints. Has some cute mouse posters. Art by Lucie Dumas on Bonanza - artist in Quebec, Canada, has cute drawings of mice. See also her web site. Barewalls - Posters and Prints. Has mouse and rat posters. Cards By Mouse - Lots of cute e-cards, including House Mouse cards. Denise Every Art on Etsy - has cute mouse drawings. Ellen van Deelen Photography - cards, prints, etc., of rats from Ellen van Deelen in the Netherlands. Fabric with rats - rats on a paisley design fabric from the U.K.
Gerodean’s Mouse & Rat eCards - cards with mice, rats, ferrets and more from Gerodean Elleby in Sweden. House Mouse Designs - Lots of neat mouse stuff to buy! Has a separate page for rubber stamps. The Illustrated Rat - Artwork by Drusilla Kehl, NY; also check out her blog, Etsy site, and Zazzle page. 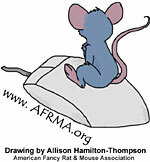 KMCoriginals Art by Kathy Clemente - cute rat & mouse drawings. Lichenesque’s Shop - artwork by Lynne Gurnee that includes several rat pictures. Mewingham Manor - Artwork and Figurines by Laura Von Stetina. Ratcards.com - original color-pencil illustrations by Robyn. The Rat Fan Club Merchandise Page - afghans, snuggle scarf, postcard, bookmark, etc. RubberHedgehog Rat and Mouse Rubber Stamps by RubberHedgehog.com - Quality rubber art stamps. Suzanne Le Good’s Cats - Artwork by Suzanne Le Good with artwork of rats, mice, cavies, and other animals. Vintage Printable - Vintage posters of mice and other animals. What The Fox - Art and illustrations including rats by Chantelle Loca Roberts, Burton upon Trent, England. Busy Bee Studio - cute felted mouse figurines by Helen Charlton in Durham, U.K.
Charming Tails - now from Enesco. Very cute figurines by Dean Griff. Christmas Mouse - Gifts and Collectibles with some very cute mouse items. Crazy Critters - by Jessica Reibelt, Australia. Small handcrafted miniature ornaments and earrings. D. D. Mason Sculptures - has cute mouse sculptures. The Drawing Room - artist Mairi Fraser makes felted and linen mouse figurines in Inverness, U.K.
Enesco Business with various Mouse collections: Christmas Mice, Mouse with Bell Ornament, and 2016 Mice Nativity PPK 18pc from the Heart of Christmas Collection. Look for them on eBay and other online stores along with past figurines such as Mouse Skating Glass Ornament from the Heart of Christmas Collection, Studio G fabrock Mice, and Home Grown Mice. Felteko Arts - Hand felted mouse figurines made by Neko Seabridge in Kent, U.K. Forever Pets Gift Company - Hand made rat art doll made in the U.K., see the Etsy shop for other animals. Kittys-Critters.com - Cute mouse figurines and ornaments. Kösen studio-haus - Lifelike creations of distinction. Makes nice stuffed rats, and other animals. L.A. Burdick - handmade Chocolate bonbon mice for wedding favors, baby party favors, Hanukkah, in general, and as samplers. Megan Davies Original Art - Original Art by Megan Davies, England, also known as Pannya Art - makes rat magnets, key chains, sculptures, custom artwork, etc. Mumsey’s Mouse House - Handmade collectible felt mice Christmas ornaments designed to be heirlooms made in the U.S.A.
Paul Jenkins Sculpture - Contemporary animal sculptures (including mice) from Stourbridge, West Midlands, United Kingdom. “Rats The Way To Do It! !” - Rat figurines made by Border Fine Arts. Look for them on various sales sites. R. John Wright Dolls, Inc - makes collectable hand-crafted mice figurines (search for “mice” or “mouse”). Richard Cooper & Company - Bronze mice by artist Michael Simpson and by Butler & Peach. Sandi’s Soap Scents - makes handmade soaps in the shapes of rats/mice. Wee Forest Folk® - Miniature mice sculptures. Zadar Miniatures by artist Randall Zadar - Foundry Bronze, Hand Painted, Collectible Miniature Figurines with mouse figurines. George G. Harris Wildlife Collection - Has animal pins including a mouse. JagWear - Custom made jewelry. Makes glass rat charms. The Rat Fan Club Merchandise Page - jewelry, snuggle scarf, afghans, Lixit food hopper, etc. Angelina Ballerina - Very Cute! Lots of fun things to do. Brambly Hedge - The official site for all friends of Brambly Hedge. Redwall Abbey - The official Redwall Abbey site. Disney.com - Go to the “Ratatouille” site. Ratatouille Movie Review - read a movie review by an AFRMA member. The Tale of Despereaux - Movie about a brave mouse! Rat Icons - Downloadable rat icons for your computer from the Federal Bureau of Rats (FBR). Creatures and Critters - Find, buy & sell animals, pet supplies, and services. Pet Rodents - Has games, forum, mouse genetics, etc. for many types of small rodents. PetStation - The Guide To Natural & Enlightened Pet-Keeping. The CritterStation section has links to small animal clubs and a marketplace. Small Animal Channel.com - The website for small animal lovers by Fancy Publications/Critters USA magazine. APOPO - APOPO trains Gambian African giant pouched rats to detect explosives and diagnose disease. People can adopt a HeroRAT for a monthly fee and buy gifts to help the cause. Help the rats save lives in Cambodia. BrandyDesigns Fancy Rat Signs from BrandyDesigns - Add a unique sign for your Rattery! Crown Awards and Trophies - Americia’s largest awards manufacturer. The Dapper Rat - Rat merchandise company in Australia. Fine Garden Products - Has rat sculptures and other garden items featuring rats! RATLIFE.org - A wildlife documentary “The Laboratory Rat: A Natural History” follows the lives of domestic rats after being released into a large outdoor enclosure. “The Rat On My Piano” - The Eclectophonics Jazz Ensemble. A music CD inspired by a rat. Read a review. The Rat Warehouse - A British company that has a lot of rat related products. Breeder’s Assistant - Pedigree and record keeping software for fancy rats, hamsters, and other animals. Breed Mate - Pedigree software for dogs, cats, and other animals. Evans Software Services - Pedigree and record keeping software for rats/mice, hamsters, and other small animals. GDVL Software - a German breeding database software for rats, mice, hamsters, and other small animals. iBreed - Pedigree and Livestock Management System. KinTraks - Animal Breeder Software for fancy rats and other animals. Zoo Easy - Breeding software for fancy rats, mice, hamsters, and many other animals.